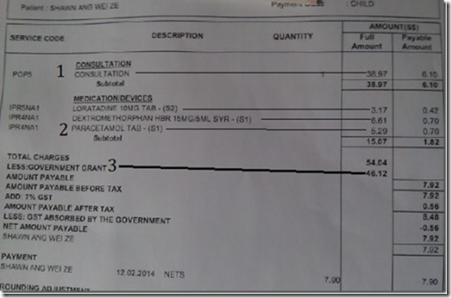 Subject: Who are the real beneficiaries of overinflated costs in our public healthcare system? MOH appears to have overpaid for consultation, medications, etc. This issue was highlighted to Sylvia Lim and copied to you last year. Did you guys not understand my feedback? If there were factual inaccuracies or wrong assumptions, the least you could have done was highlight them to me. But you have chosen to behave as arrogantly as PAP. Healthcare subsidies appear to be overly-generous only because the PAP government first overinflated costs. I will again use polyclinic bills (consultation fee) to illustrate my point. From the bill above, the full amount of $41.68 is obviously incorrect because this could be more than double the amount charged by a private GP for short consultations, eg clinic in Tampines St 21 charges only $18. Even for long consultations, rates at private GPs are much lower. Polyclinics are located in HDB estates and costs should be pegged to private clinics nearby. If a private GP charges $20 to $25 for consultation, one would expect a polyclinic to charge the “full amount” of about $10 to $15 at most. But this is obviously not going to happen as the generous subsidy suddenly vanishes into thin air when patients are required to pay $11.80. Why did MOH set the consultation “full amount” at a ridiculously high $41.68 across the board, regardless of short or long consultation? Such dubious costing practice would not have happened in any democratic country. Who are the real beneficiaries when costs are overinflated? Polyclinics not only overcharge the consultation fee ‘full amount’, they even overcharge for medication (image below). For example, Paracetamol which retails online for less than $0.40 per packet of 16 tablets, MOH priced the cost of a generic drug at more than $5, equivalent to more than 12 packets. This despite bulk purchases in the tens/hundreds of thousands of tablets. – Which companies do MOH purchase medications from? – Why is MOH agreeable to a huge profit markup? – Are profits generated subsequently returned to the government? – Are there no cheaper alternative drug companies? Since there were about 5 million polyclinic visits last year, a non existent subsidy of, say, $20 per patient would have cost taxpayers an additional $100 million. What about overinflated “full amount” at public hospitals? Despite having increased healthcare operating expenditure by 50% from FY 2013 to FY 2015, benefits have hardly trickled down to Singaporeans. In fact, costs have increased for most. What’s really happening? WP MPs are in a position to prevent the arbitrary overinflating of healthcare costs and shed light on the ridiculously-high “full amount”. Who are the real beneficiaries of overinflated costs in our public healthcare system? This entry was posted in WP. Bookmark the permalink.